Nigerian midfielder and Leicester City player, Wilfred Ndidi is getting ready to tie the knot with his longtime girlfriend. 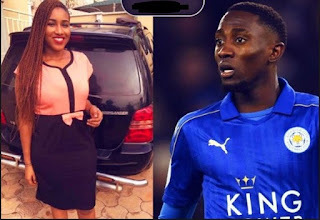 Super Eagles star, Wilfred Ndidi is set to marry his long time girlfriend come May 10th, (next month), according to reports. The Leicester City midfielder will tie the knot to a medical student and the love of his life, Dinma. Dinma has been the longtime girlfriend of the Lagos-born Ndidi and she hails from Kogi State. The Leicester City star has professed his love for her to the rest of the world when he displayed her name in his boots for both the 2018 World Cup in Russia as well as the 2015 U20 World Cup in New Zealand.